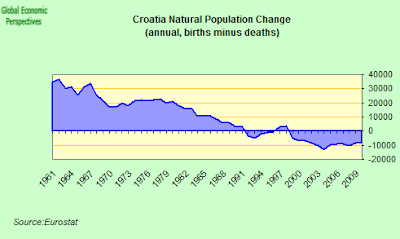 BONOBO LAND: Croatia: On The Brink of What? As Croatia enters the final stage of its EU membership talks, it is perhaps a fitting moment to review the other half of the picture, namely where the Croatian economy finds itself, and what the outlook might be for a continuing convergence with the requirements of Euro membership. Understandably, EU officials are fairly cautious about the likely shape and progress of the forthcoming talks (the Union has, after all got rather a lot on its plate at the moment), but Croatian Prime Minister Jadranka Kosor is decidedly more optimistic, since while she recognises that this last phase is likely to be "really difficult and demanding" she still believes that negotiations could be concluded by the end of the year, which would mean that membership in 2012 would become a possibility. 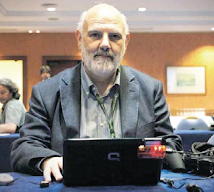 Whatever view you take on the likely progress of the talks, one topic on which it is hard to be optimistic in the short term is outlook for the Croation economy. Despite the fact that the country may not have too many difficulties complying with the original Maastricht Euro membership conditions, the newfound interest among those responsible for EuroGroup decisions for sustainability and longer term competitiveness mean that a country whose economy has as many structural distortions in it as Croatia’s does may well find a growing number of new obstacles thrown across its path. Unsurprisingly, the global economic and financial crisis have taken a significant toll on the Croatian economy. 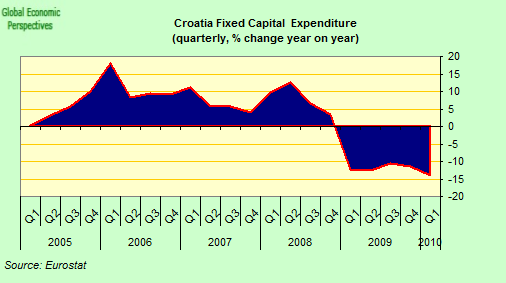 Given the background of a large current account deficit, a high level of external debt, and significant balance sheet exposures to interest and exchange rate risks, the pressure from reduced capital inflows was always going to cause problems, and it did: financial asset prices collapsed, sovereign spreads shot up, and the Zagreb stock market plunged. 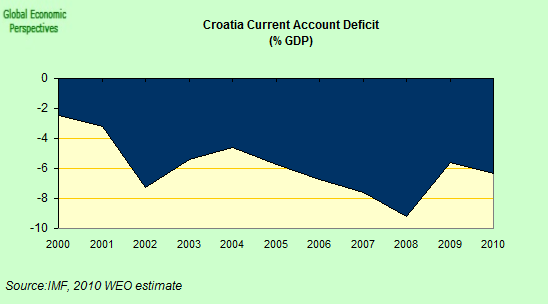 As a result of the combined impact of the difficult external conditions which prevailed and the ending of the domestic credit boom Croatia’s GDP fell by some 5.8% in 2009, following a number of years of strong (if not sustainable) growth. Even though in the first three months of this year there were been some tentative signs of recovery the economy was still down by 2.5% on an annual basis. Personal consumption fell by 4.1%, which was not surprising given that new credit has all but dried up, but more worryingly the drop in fixed capital investment accelerated to an annual 13.9% during the three month period. 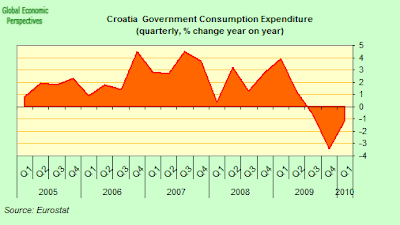 Government consumption fell for the third consecutive quarter and was down by 1.1%, and the only positive point was the net trade impact, since the export of goods and services rose by 3.6% (following five consecutive quarters of decline) goods and services imports fell by 4.8%. 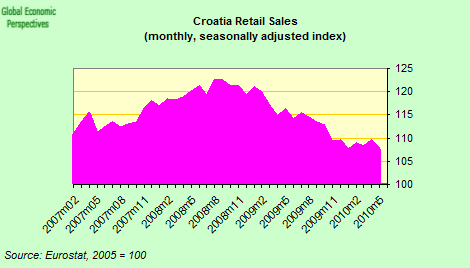 Given the high level of external indebtedness of the Croatian economy (net external debt is currently running at around 95% of GDP) and the sensitivity of the financial markets to fiscal deficits, there is likely to be little in the way of a revival in domestic demand, depending as it does on the availability of credit. Which leaves exports to pull the cart. But this is where the high level of euroisation of the economy becomes a problem since obtaining export growth after many years where the country has run a substantial trade deficit is hardly going to be easy. In fact financial euroization even increased during the crisis, and at the end of 2009 about 70 percent of the total bank credit and over 65 percent of bank deposits were either denominated in or indexed to foreign currency. As the IMF note in their latest report price and cost indicators suggest that competitiveness has been deteriorating in recent years and Croatia’s real effective exchange rate is surely overvalued. Yet all those Euro denominated loans make it very difficult for the authorities to contemplate outright devaluation of the kuna, while the prospect of having to manage an internal wage and price correction is hardly an attractive one, as we can see in the Latvian and other cases. Croatia’s unit labor costs have risen significantly faster than those of its principal trading partners in recent years, due largely to the fact that wages in the private sector were pushed up by rapid wage growth in the public sector. As a result, the overall wage level is high relative to Croatia’s productivity following non-competitive wage setting in a public sector which employs around a quarter of the labor force, not counting public enterprises. 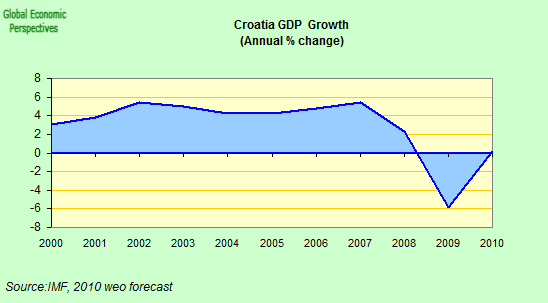 As the IMF note, rigidities in the Croatian economy are substantial, with strong labor regulations constraining labor market flexibility, resulting in high employment in the gray economy, a proliferation of temporary work contracts, both of which reduced employers’ incentives to expand employment during the boom years. The impact of the grey economy is clearly reflected in the disparity between the official unemployment rate (of around 19%) and the EU harmonised one accepted by Eurostat (which shows unemployment to be nearer 10%). Another factor to be taken into account is the rapid ageing of the Croatian population, following many years of very low fertility, and a steady increase of life expectancy. Croatia’s working age (16-65) population peaked in the early 1990s, and is now in long term decline, while the old age dependency ratio is set to rise and rise. 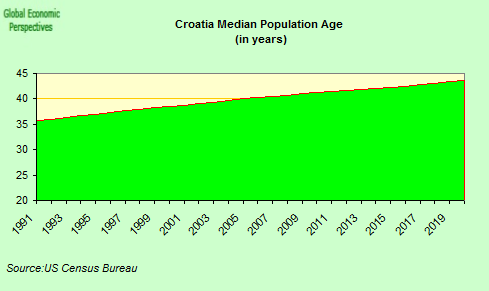 Indeed about a quarter of Croatian population are now retired, a fact which also reflects the presence of relatively generous pension and social benefits conditions, benefits which were available during the years of increasing borrowing, but which are surely now hardly sustainable as the time comes to pay back some of the accumulated debt. Looking ahead to the remainder of 2010 the contraction will most likely continue. The IMF forecast in April a miniscule 0.1% growth, but since that time optimism for the global expansion has waned, and in particular demand from many of Croatia’s trading partners is likely to be more muted than anticipated. Investment is unlikely to recover its earlier momentum, burdened as it is by an indebted private sector and a public sector looking to make cut-backs. Private consumption will also remain under the influence of the contraction in consumer credit. 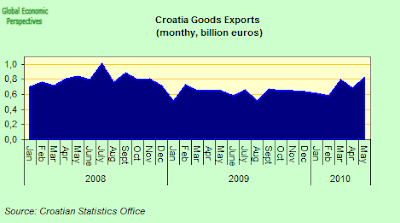 While exports should remain supportive, with imports continuing to remain low given the weak domestic demand, goods trade exports may not be as strong as some expect given the weaknesses in the European recovery, while tourism may well be affected by the high levels of unemployment which still exist in many of the relevant countries. Rising fiscal concerns will only add to the slowdown of the EU recovery (given the negative demand impact of the harsher fiscal policies) so a contraction of between 1% and 1.5% in 2010 does not seem unlikely. 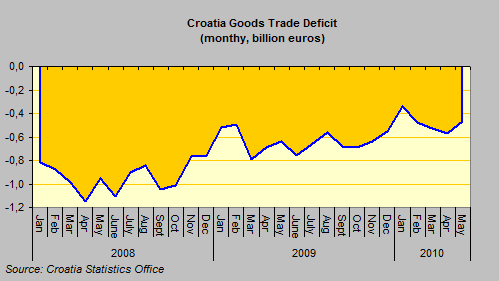 In addition Croatia remains vulnerable to contagion risks from adverse market sentiment in the region. This contagion could take the form of tightening financial constraint such as a rise in borrowing costs, or a reduction in cross-border flows. On the other hand the absence of Greek banks in Croatia and the limited real sector linkages with Greece should minimize the risks of direct spillovers from that quarter. The real threat would come from a more generalised crisis across the EU’s Southern and Eastern periphery. On The Brink Of What? 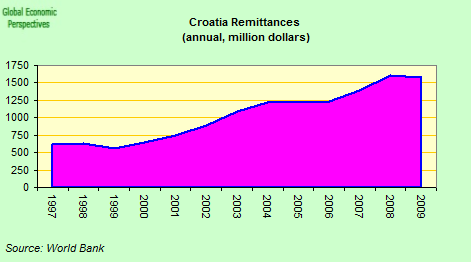 So, after living for many years on borrowed money and borrowed time, running a significant current account deficit and accumulating a large external debt, Croatians are now likely to be faced with the harsh reality of living in a rapidly ageing society at a time when external competiveness has been severely undermined. In the short term the economy may have stabilised, but in the longer term the challenges are immense, and should not be underestimated. 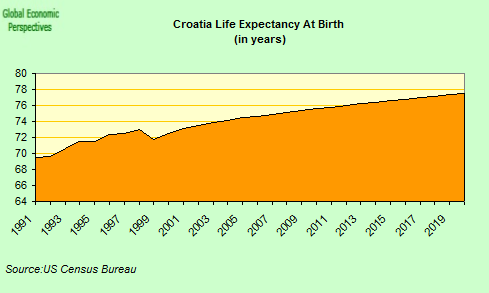 Like many economies across Eastern Europe, Croatia is going to have to straighten out the structural distortions and pay down its external debt at just the time the oncosts of societal ageing are going to start to bite deep. In addition a rigid labour market and an overweight public sector pose serious problems for the transition to a dynamic and competitive economy. Many changes are needed, and most Croations are only all too well aware of this fact. But one factor which doesn’t seem to get the attention it deserves is the continuing threat to long term economic stability posed by having such a low (tfr 1.4 – or only two thirds of replacement) birth rate. 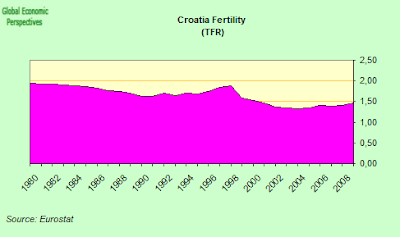 To make matters even worse, the wage differential with Croatia's West European neighbours means it is an attractive proposition for many young people to go abroad to work, and while the remittances all those migrant workers send back may be very welcome back home - especially given the difficulties Croatian industry has in selling abroad - a country with fertility well below the replacement rate should not be exporting labour to pay down a current account deficit. The way to settle the debts is to provide work in export industries so people will stay at home, and contribute to the maintenance of the health and pension systems. Like most societies in Eastern and Southern Europe the Croatia needs to address this other imbalance, and it needs to start to do so soon, since the clock is ticking, and it won’t stop doing so. At this key moment in the country’s history it is hardly difficult to recognise that Croatia is effectively on the brink of something, but whether that something is going to be long term sustainability rather than something that it is better not to think about, well, the answer to that question can only be given by the Croatians themselves.